"We use the information available in the Red Hot Jazz Archive database in order to study the collaboration network between jazz musicians. 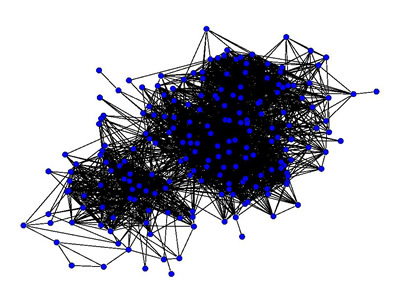 First we study the collaboration network between individuals (first image). In this case each vertex corresponds to a musician. Two musicians are connected if they have played in the same band. The figure shows the network obtained using this construction." 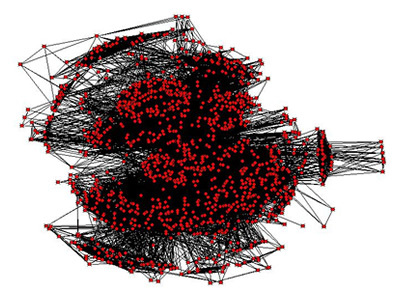 "Then we study the collaboration network between bands (second image). In this case each vertex corresponds to a band. Two bands are connected if they have a musician in common. The figure shows the network obtained using this construction." "The community structure analysis reveals that these constructions capture essential ingredients of the social interactions between jazz musicians. We observe correlations between recording locations, racial segregation and the community structure. A quantitative analysis of the community size distribution reveals a surprising similarity with an e-mail based social network."